Never worry again about having their hair, your skin, or your clothes turn purple! 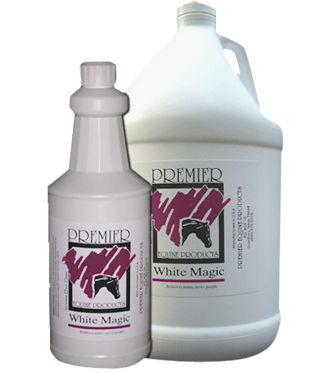 Premier White Magic has been the leading whitening and stain removal shampoo in the horse and livestock industry for over 15 years! Premier White Magic Shampoo brings out the beautiful hair on paints, grays, and palominos.